Happy Holidays to everyone! Start off your celebrating by picking up a copy of my new book, The Gambler. It is free through Sunday, Dec. 21st, after that it’ll sell for 99 cents. 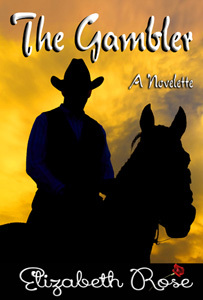 Jake Stonewall is a cheating gambler who wins a mail-order bride in a poker game. Little does he know the woman is Rose Walker, someone from his past who can ruin him with just one word. Also, make sure to pick up a copy of The Bounty Hunter, my previous release from the beginning of the month. This book has placed in the top 50 best-selling Westerns on Amazon all month! And watch for more Old West novelettes coming in the new year. 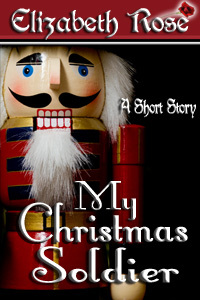 To kick off your holiday reading, Monday, Dec 22nd – Friday, Dec. 26th, I’m offering my Christmas short story, My Christmas Soldier, for free! And please remember to leave reviews for all my books on Amazon, as reviews really help out an author. I have a lot of plans for the coming year, continuing with new books from the Tarnished Saints Series, more new recipes, book trailers, and even a guest-appearance author page. And I will also be launching my new Fairy Tale Series called Tangled Tales. The first book in the series is based on Little Red Riding Hood, called Lady and the Wolf. These will also be medieval and paranormal, for those of you who are fans of that genre. Watch my site for upcoming sneak peeks at the covers. Thank you all for your undying support, and a special thank you to my street team. If you’d like to join my street team, I still have some openings. Just click the ‘street team’ tab at the top of my webpage. I leave you now with my holiday greeting card – and also my new holiday book trailer. Have a blessed, safe holiday season. May we all remember to appreciate the good in our lives and all that we have, especially our loved ones at this time, and not to take them for granted. Have a magical Christmas and a prosperous New Year! 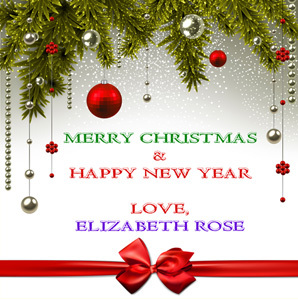 This entry was posted in Free book, New release, Uncategorized, Western and tagged FREE book, holiday story, new release, western romance by Lizrosek. Bookmark the permalink.